English/Iranian soprano Natalie Montakhab studied at the Royal Academy of Music, London and the Royal Scottish Academy of Music and Drama, Glasgow. 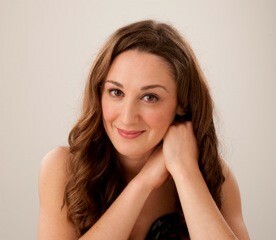 Natalie recently made an acclaimed debut at Welsh National Opera in the role of Gretel/Hänsel und Gretel. She will make her English National Opera debut as Yum Yum/The Mikado in 2017. Natalie is currently understudying Zerlina/Don Giovanni at English National Opera. At this year’s Royal Albert Halls Proms she sang in Rossini’s Semiramide under Sir Mark Elder and recorded the work for the Opera Rara label. After her recent performance of Haydn’s Nelson Mass with Stour Singers, the choral group awarded Natalie an honorary fellowship. With Garsington Opera's Opera for all, Natalie has been singing Tatyana/Eugene Onegin this summer. Earlier this year she understudied Karolka/Jenufa at English National Opera and made a Birmingham Opera company debut singing Belinda/Dido and Aeneas under Robert Howarth. Under Edward Gardner OBE, Natalie sang Marzelline/Fidelio at Sitzprobe rehearsal. Previous covers at ENO include Zerlina/Don Giovanni, Papagena/The Magic Flute and for its World Premiere, Zenna Briggs/Sunken Garden (by Michel Van der Aa). Natalie covered Jemmy/Guillaume Tell (Rossini) at WNO and Vixen/Příhody lišky Bystroušky at Garsington Opera. Natalie sang Papagena (and covered Pamina) for Diva Opera and sang the role of Newspaper Seller/Death in Venice at Garsington Opera under Steuart Bedford OBE. Susanna/Le Nozze di Figaro was Natalie’s first role at RSAMD Opera School and she subsequently shadowed the role for Scottish Opera; Vixen/The Cunning Little Vixen was her debut role at Scottish Opera, in collaboration with RSAMD Opera School. Natalie sang in the London Handel Competition Final 2013 “exactly what a Handel voice should be” (Early Music Review) and won 2nd prize at the AESS English Song Competition. At the London Handel Festival she sang the role of Aminte/Aminte e Fillide with Laurence Cummings and the London Handel Orchestra. As an Iford Arts Young Artist she sang the role ofGalatea/Acis and Galatea in a concert version with Christian Curnyn and the Early Opera Company orchestra. As a Debut Solo Artist in Prom 23 at the Royal Albert Hall Proms 2011, The Times noted the “wide awake, beautiful soprano voice of Natalie Montakhab”. Natalie has sung as soloist with the Royal Scottish National Orchestra (Peer Gynt Suite), the BBC Scottish Symphony Orchestra (Bartok’s Village Scenes) and the Scottish Chamber Orchestra (Dido and Aeneas) under Nicholas McGegan. Natalie is a Britten-Pears Young Artist and has appeared as soloist in Bach’s St. Matthew Passion with Masaaki Suzuki and in recital (On this Island/Britten) with Sir Thomas Allen. Natalie is a recipient of the Independent Opera scholarship and a Dewar Arts Award. She sings for and supports Music charities Music in Hospitals and Lost Chord. “I enjoyed the wide awake Soprano voice of Natalie Montakhab”. Natalie Montakhab review "All eyes are on Musetta - an engaging performance from Montakhab"